I am ashamed to confess how little I know about physical make-up of any of my books. I haven't even a first edition4 of "O Pioneers! "5, but I remember that it was bound in ribbed cloth, about the color of a mustard plaster, and very ugly. Later it was put out in a darker cloth6 and was, I thought, a distinctly better looking book thatn that first issued. I have not one at hand to consult, but that is my impression. It is this second printing which is now on the market. The "Song of the Lark"7 was first issued8 in a rough blue cloth,- not exactly ribbed, but a cross-weave. I haven't a copy of the first edition of that either, I find. I have only copies of the English editions of those two books9, because I thought them much better looking than the American editions. I think the total printing10 of "The Troll Garden"11 was not more than 1,200 copies. I assure you it is no fault of mine that the new edition12 of "April Twilights"13 is to be sold at such a shocking price. I, too, am sensible to expense,—but as you have probably gathered, I am not sensible to first editions, since I haven't them of my own books. I suppose it's no use telling a collector that the two-dollar edition will be just as good! I don't believe Professor Phelps14 and I could possible agree on any book. A few years ago I couldn't help calling attention to some of the amazingly stupid things he was glibly spinning off about Russian literature15, and I don't believe he liked it. It's amusing that a man should appoint himself a specialist upon a literature written in a language of which he doesn't know a word; a perfectly childish performance. I must ask your indulgence for this long delay. I have been out16 of town2 and have had to neglect many things. And now I am able to give you very little information. I find that the second binding of "O Pioneers!" is a seal-brown, rough cloth, stamped in orange. Document is two leaves, typewritten on recto of each leaf only. Includes one envelope, handwritten. The first printing of the first edition of O Pioneers! was published by Houghton Mifflin on 28 June 1913. It was issued in three bindings. The first binding featured light yellow-brown vertically ribbed cloth, with the lettering stamped in dark brown. Cather asked Houghton Mifflin to change the color of the binding to a "sober brown" and sent a sample to guide them (#0480). 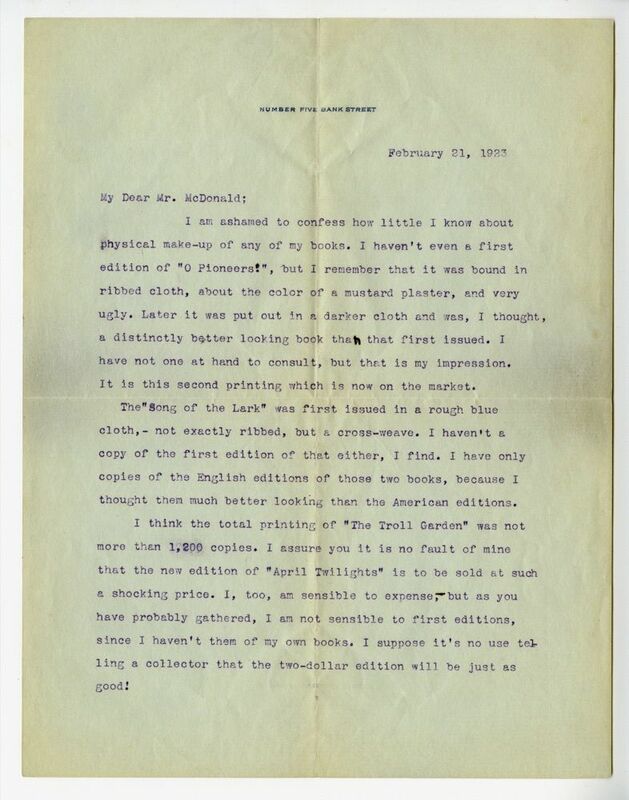 Ferris Greenslet's 30 December 1919 letter reports that they bound that fall's printing in the new color. The first printing of the first edition of The Song of the Lark was issued in two bindings: blue smooth cloth with gilt-stamped lettering and blue vertically ribbed cloth with the same lettering. The first English edition of O Pioneers! was published by Heinemann in August 1913. It featured dark purple linen binding. The first English edition of The Song of the Lark was published by John Murray in March 1916. It featured blue coarse linen binding. The first printing of the first edition of The Troll Garden was published by McClure, Phillips and Co. in 1905. After the publishing house was dissolved in 1906, Doubleday took over the edition, publishing a second issue with a new binding. It is unclear how many copies of the first edition were printed. Alfred A. Knopf published 450 signed and numbered copies of the first limited edition of April Twilights and Other Poems (1923) on 20 February 1923 for $7.50. The first trade edition appeared on 23 April 1923 and sold for $2.00. Cather may be referring to opinions expressed in Phelps' collection, Essays on Russian Novelists (1911). Cather left New York for Red Cloud at the end of November 1922 in order to visit her parents for their 50th wedding anniversary and the Christmas holiday. She returned to New York in the middle of January 1923. McDonald, Edward David (1883-1977). American bibliographer and scholar. 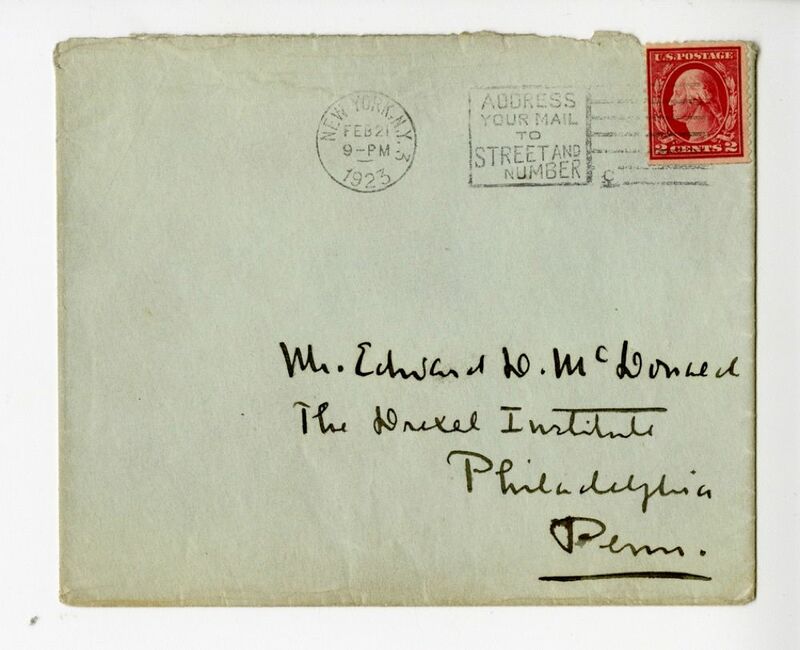 Edward McDonald graduated from Indiana University in 1910 and worked as the head of the English Department at Drexel Institute of Technology in Philadelphia, PA. He and his wife Marguerite Alice Bartelle, a fellow Indiana graduate, had two children, John and Edward McDonald. 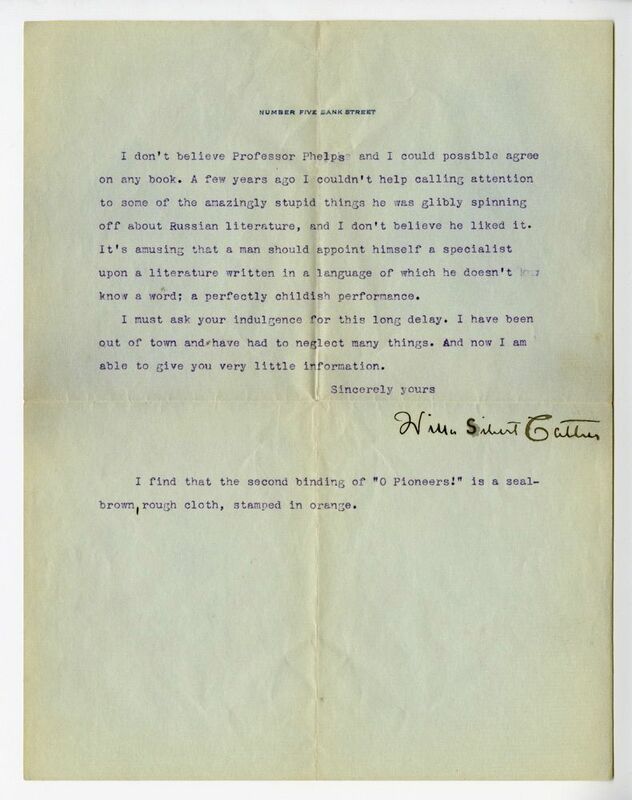 McDonald solicited bibliographic information from Cather about her publications in 1923. McDonald compiled A Bibliography of the Writings of D. H. Lawrence (1925), edited Phoenix: The Posthumous Papers of D. H. Lawrence (1936), and co-authored the first history of Drexel, Drexel Institute of Technology, 1891–1941 (1942).